It’s a small world, for example the musical threads between Cambridge and Salford are pretty strong at the moment, despite the distance. Dave Hammond (Cambridge 105FM) and I are sort of revolving around the same musical firmament albeit in slightly different directions. I send him things, he gets bands to send me things, I hear things on his fantastic Smelly Flower Pot Show that I end up investigating etc etc. That has ended up in German Shepherd records doing things with Bouquet of Dead Crows, who in turn know, and have worked with, James Burling, who in turn, sent me the new album from his band The Seven Twenty. Listening to music as a more or less full time occupation can lead one to be a little jaded, somewhat dismissive and often quite bored with the tsunami of things that come in seeking some form of support. Once in a while though something comes in which immediately grabs the attention and makes listening to music completely worthwhile. From the opening notes of this album I knew it was a classic. The Seven Twenty are an indie rock n roll band from Cambridge, England, and are signed to Castles in Space Records . Their self-titled debut album (catalogue number Cis005) is released on 30th November 2015, preceded by lead-off single ‘Haiku’. The album will be available via all popular digital stores, and on limited edition 10” vinyl. 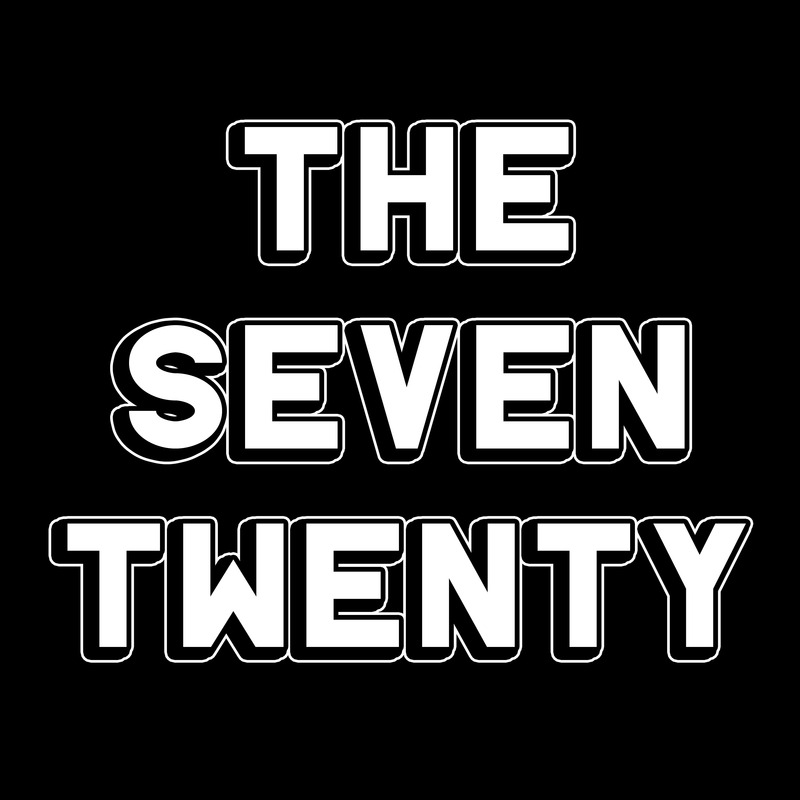 The Seven Twenty are currently a three piece, comprising James Burling (guitar, lead vocals, songwriting), Stewart Harris (bass, backing vocals) and Helen Robertson (drums, backing vocals). The line-up is expanded for the album. This is an album packed with wonderful songs, memorable melodies, marvellous lyrics and a great sense of fun. Burling is a master of song-writing with an easy, open style which grabs your attention, he mines the rich history of english and american pop tune-smithery, without resorting to cliché, to create a timeless collection of ear-worm tunes which call to mind the Velvet Underground, Steely Dan, The Go-Betweens and 10cc at their best. It’s a short set – eight songs in 30 minutes – but from the opener “Corridors” with it’s slow blue eyed soul, rich strings and delicious wah-wah solo from Neil Bruce from Bouquet of Dead Crows you are drawn in and held prisoner by an album with a great collection of excellent tunes. The single “Haiku” is pure pop heaven with a raw guitar and vocal hook which requires repeat listening. It’s the sort of two chord thrash that Lou Reed would have made laconic or taciturn, Burling makes it joyful. “Wonderful” has a Spectoresque quality, with a dash of Black Francis that would not be out of place on an early Pixies album. “Coca Cola Can” with it’s sparse string arrangement could have been an early Jagger/Richard ballad, “FU, NY” is all springy acoustic guitar with an early Paul Simon vibe, and “90 MPH” has the exuberance of something from “16 Lovers Lane” mixed with a cut from “Katy Lied”, and a dash of Calexico, with a plaintive deguello closing the song. “Technicolor” is in the best tradition of indie-pop songs, joyful and celebratory , and closer “(Can’t Find No Love In This) City” acts as a perfect end to a fine collection. The debut album was recorded in New York, London and Cambridge and includes tracks recorded in Henry Rollins of Black Flag fame’s apartment, with the New York City Choir featuring on the track Wonderful. The first single, Haiku is already gathering praise from local and national press, and the band have supplied a specially recorded track for an Oxfam charity compilation to be released in late October 2015. I play guitar and do the vocals, Stewart Harris plays the bass and we had an endless stream of drummers through the studio door as we couldn’t seem to hold one down for very long for some reason. Neil Bruce from Bouquet Of Dead Crows plays the lead and some addition guitar on Corridors, the big epic solo on the end of Wonderful and the one on 90 MPH too. The strings are by the Lower East Side String Quartet (who I met in a bar when I was recording the early sessions from the album), the trumpets on 90MPH are by a mariachi band’s trumpeter (we wanted to get the full band on there originally but decided we HAD a full band anyway…) and we borrowed Huw the drummer from Stewart’s other band for Haiku because he’s super cool and I wanted to get him on that track cos he’s fun to hang out with. The New York City Choir (met them in a bar too) let me go sing with them (God knows why) one evening even though I was semi-drunk and didn’t know what they were singing then I somehow conned them into learning Wonderful and recorded 40 of them in a bit school hall with 20 mics 6 months later when I went back. That was a NIGHTMARE to mix, I should have used stereo mics and been done with it, but it sounds pretty huge. That one was mastered to tape for a little of that 60s saturation sound, the guitars were recorded in the rehearsal room that The Strokes used to use and we got a guy from Abbey Road to engineer the drums to get a bit of that old school sound on there – he did the ones for City too. Have you played in, are you currently in any other bands? I’m much more a ‘songs’ man than a ‘bands’ man – I’ll fall head over heels for a track but not like much else a band does. There’s a Beatlesy band called Cotton Mather from Texas who are INCREDIBLE though, I love most of what they put out and I’m trying to trick Stewart into loving them too – I LOVE the Strokes first album, some Velvet Underground stuff, Ryan Adams about 50% of the time, Aphex Twin now and then, God Only Knows by the Beach Boys is the most perfect pop song I think I’ve ever heard but I can’t quite get into anything else by them, most of the Beatles singles, about 25% of the Rolling Stones stuff I guess, a little hip hop now and then…lots of stuff. I end up being more inspired by a single tune much more often than than being enamoured by a particular band. Stewart likes loads of bands no-ones ever heard of and he listens to them whilst watching old B movies that no-one’s heard of either. Have you got your tour dates yet? Are you playing in the Manchester area? We’re only 3 or 4 rehearsals in with Helen right now so we’re still piecing things together but we’ll play anywhere that will have us – we’ll probably get the album launch done then line up some proper dates from there. New York next May, definitely up for playing Manchester, love it there!! How did you end up in Henry Rollins apartment? I went Virgin Atlantic from Heathrow then took a cab from the airport (haha). You can rent it on the internet, its above a hotel in the Lower East Side. It has weird acoustics, a doorman who wouldn’t let me in when I was drunk one night even with the key and he had a signed picture of Jet (remember them?) on the wall. He wasn’t there when I was there, he would’ve hated what I was recording in his kitchen / bathroom I think – I took a laptop and some mics and holed up in a studio near there and recorded a few bits in the kitchen in the evening. The cop car sound and the arppegiated guitar that closes the album was me playing on the fire escape outside the bedroom window – the cop car siren playing along was a complete fluke, a miraculous little act of god that I didn’t even realise when I was recording it cos I had headphones on. I was like ‘WTF is this? !’ when I listened back. When you won “Best International Act” what was it for? Local Radio (Cambridge 105) does an awards show, and by being the only act to have left the country that year I think we won. We’re much more popular in America than here currently and 75% of the album was recorded over there so I guess we’re kinda international. Why the trumpet solo at the end of 90 mph? I always had that in my head since I wrote the song – I imagine a 60s Cockney bank robber running off to the Costa Del in a Mk2 Jag to lay low, and as he looks out of his window he feels a twinge of pain at what he’s done. HOW PRETENTIOUS!! Mainly though its cos it got stuck in my head and I couldn’t shake it…which is a nuisance cos I can’t play trumpet or apparently write sheet music for a trumpeter to play off easily. It worked out though. The sample at the start, incidentally, is from an old 60s vinyl I found at a flea market in Brooklyn – it’s an entire album of little spoken word passages designed to replace a DJ on a Spanish speaking radio station – so they never had to pay any on-air talent to talk between songs! Genius! The Seven Twenty played a string of sold out shows in New York in 2014, before resuming their usual local touring schedule back in the UK, and James was dubbed “arguably Britain’s Best Songwriter” by Cambridge 105 FM. In January 2015 The Seven Twenty won Best International Act and will be appearing in the UK and US in support of the new album throughout 2015 and 2016. Posted on October 7, 2015 October 7, 2015 by HalfEdgeMediaPosted in Album ReviewTagged The Seven Twenty.